My latest GFCC 1:43 scale diecast model from China has now arrived taking little more time than a model I ordered from Italy at the same time. 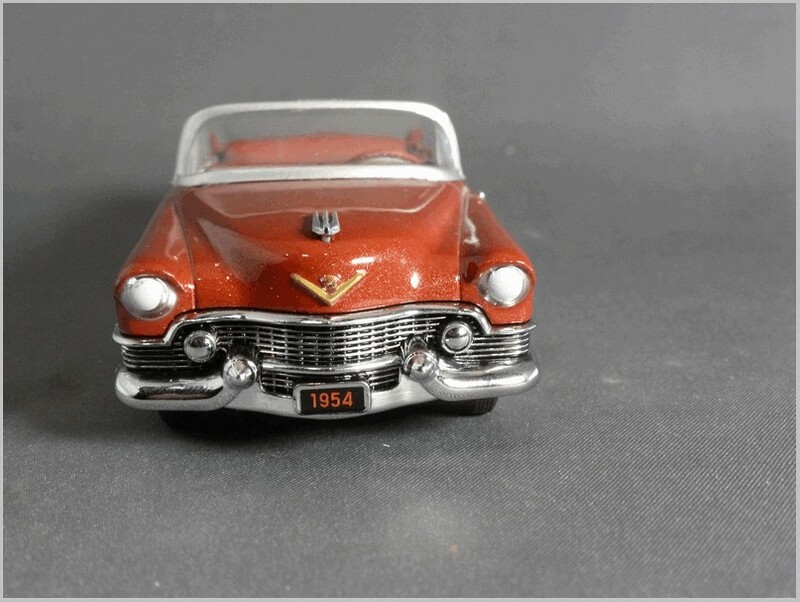 The model is of a 1954 Cadillac Eldorado Convertible. Again it comes in a box which has packing very similar to that used for all the Atlas Dinky models, yet those are said to come from a factory owned in part by Norev, and these come direct from China. 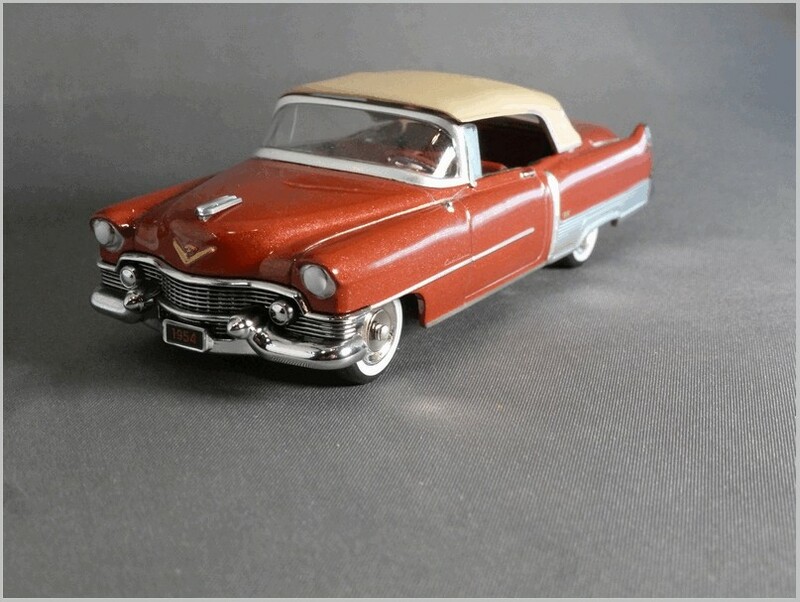 The model is painted in a rather nice red/brown metallic paint though how realistic that is as an original model is difficult to tell from the many shades of red shown on 1954 Cadillacs on the Internet. 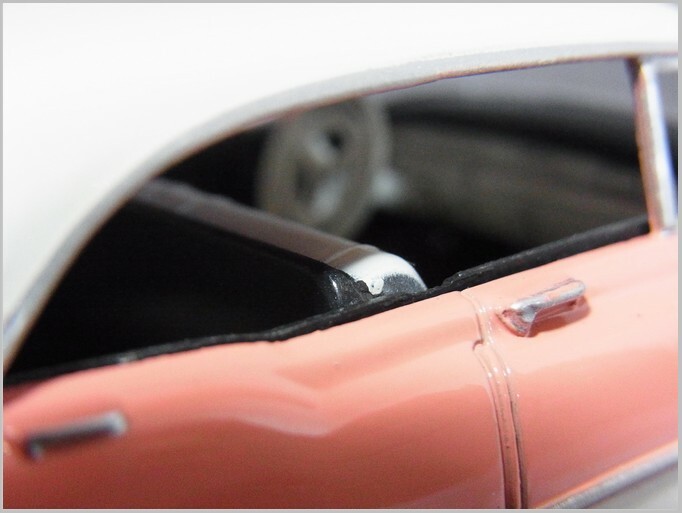 The model may be displayed without the hood but does not have a slip in component to represent the hood cover which is a shame. The interior is relatively simple but has many accurate touches like the steering wheel outer rim being duo colour as is the original cars. The doors are well painted with the shiny upper parts well printed and the electric window winder controls and other features moulded in. The dash has silvering and some printing but is rather obscured by the steering wheel fitted almost horizontally which is a shame as it is difficult to correct as the model has spun over rivets rather than the screws earlier models in the range had. The angle of the steering steering wheel is shown clearly in the photograph below. What none of the photographs above show is the face of the seats which have the inset panels moulded in white which matches many of the cars shown on the internet. Unfortunately the convertible hood needs considerable fiddling with to sit properly and when taking the photograph above I must have accidentally knocked it as it does fit better than that! 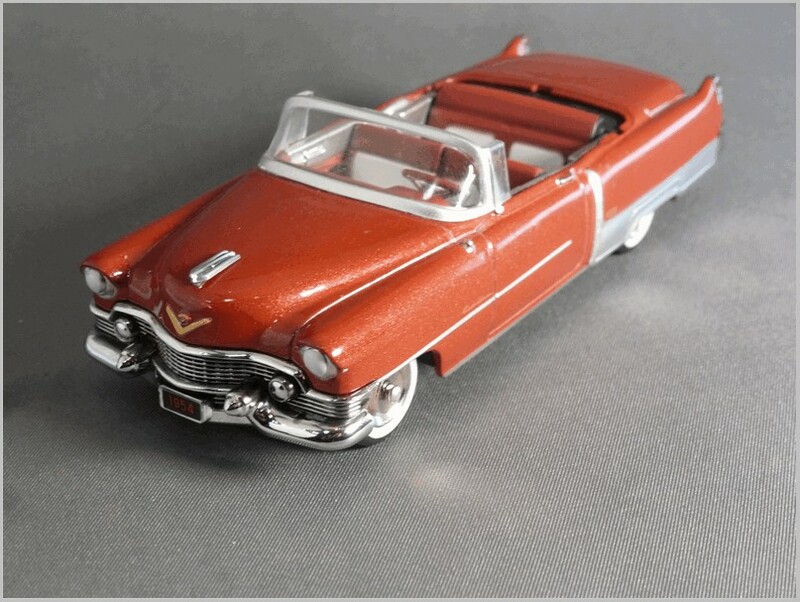 The El Dorado portrayed by this model was the second generation car new in the 1954 model year. 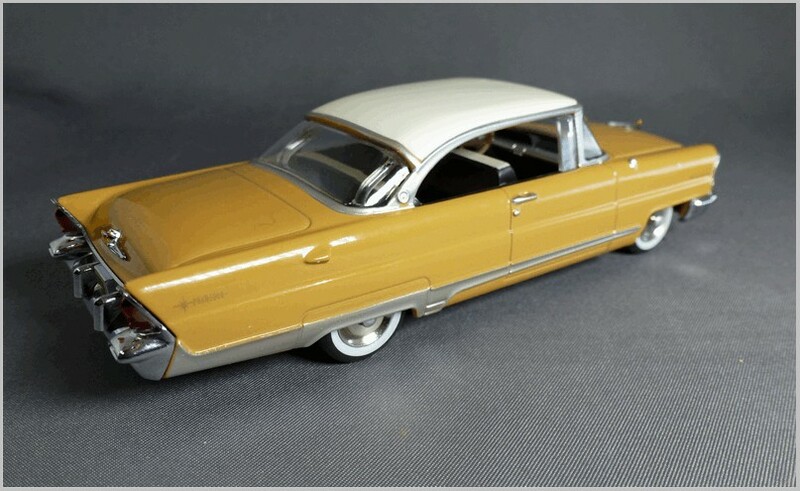 It shared its basic body shell with standard Cadillacs, unlike the first generation car, but had unique trim items like the lower rear wing aluminium panel and the crests on the rear wing. 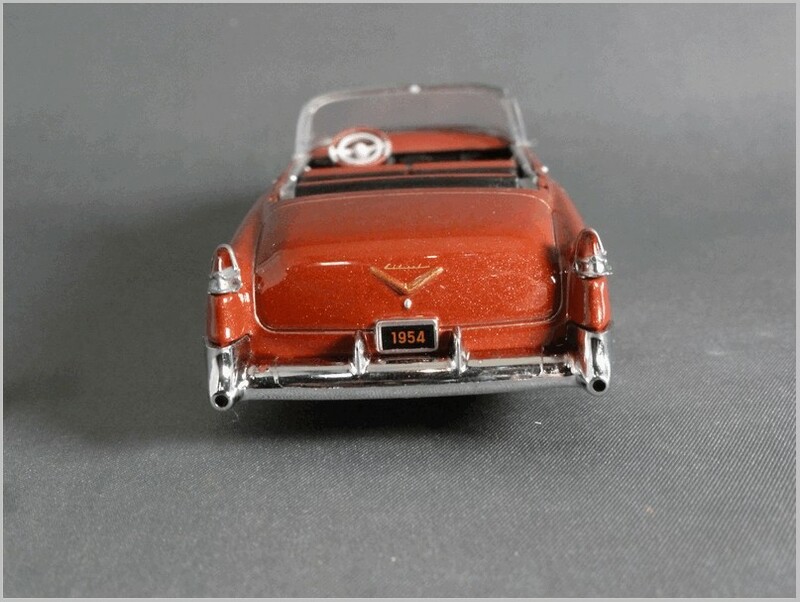 Unique features missing on this model are: wire wheels, and Cadillac crests on the seat bolsters. It was a rare car as only just over two thousand were made. As the photograph above shows the rear quarters of the car are well modelled with gold badging and crests on the boot all present. 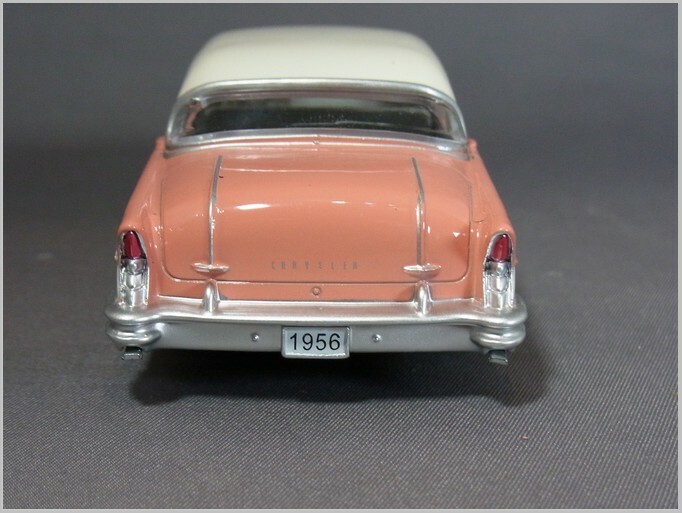 Even the white wall width is reasonable for the early 1950s, though the Dinky style wheels rather detract from the overall model. The front of the car has an impressive grille array which comes ready black washed which gives it a realistic edge. The front lights have been painted white over the silver of the light hood when a plastic lens would have been better. 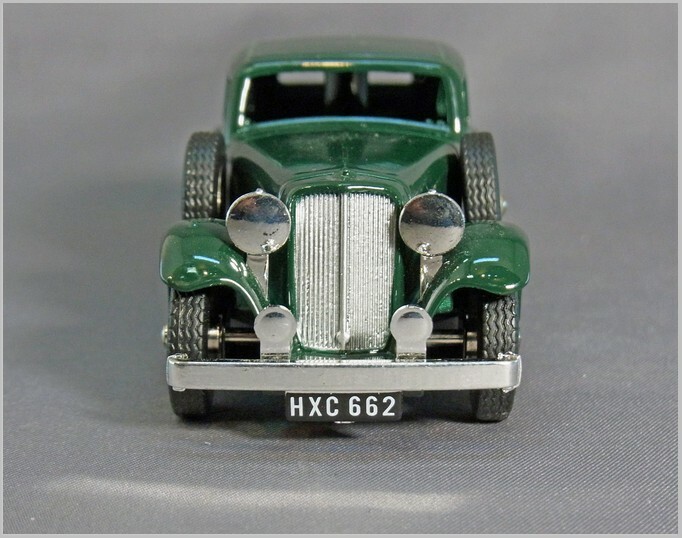 As these GFCC models are now considerably dearer then a 1:43 Oxford Rolls Royce, even though they are imported with no tax or wholesaler costs directly from China, I feel that separate light lenses are not an unreasonable expectation. GFCC models have featured before in MAR Online. 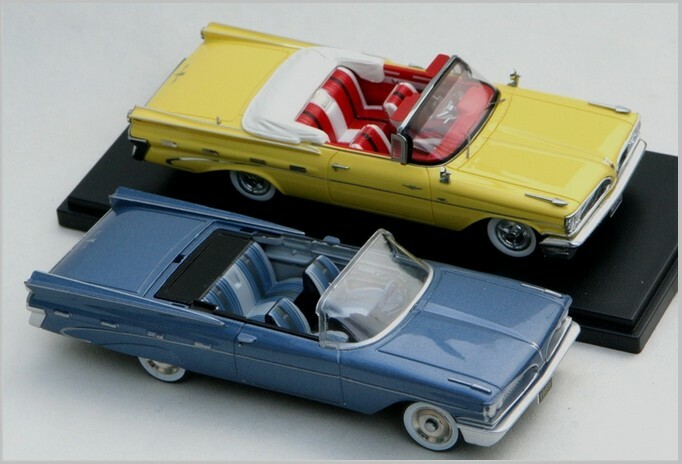 Starting with the Dinky-esque SS1 Jaguar, and then moving forward to a series of American prototypes: 1959 Pontiac Parisienne, 1955 Studebaker Speedster and 1956 Buick Roadmaster. 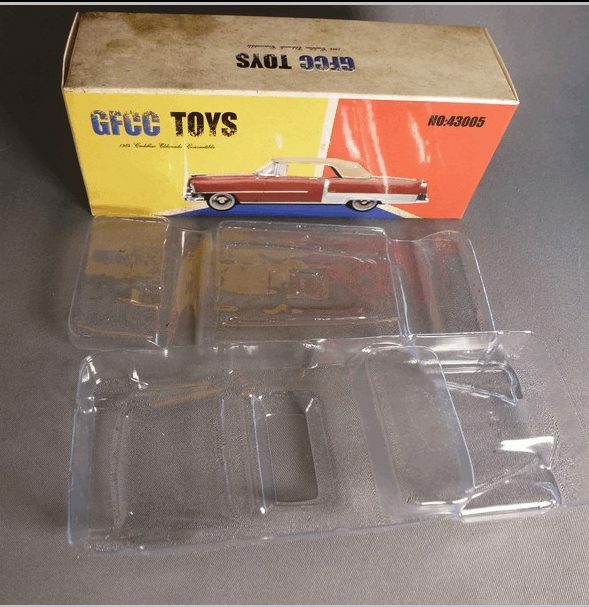 The sales directly from China and in packaging very similar to that used for the Atlas and DeAgostini Dinky models, particularly the protective inserts and tissue paper covering, makes one wonder if this is basically a direct sales operation from the Factory hiding under the guise of Tongbo Toys. As each model has been released prices have increased considerably, only partly because of the pounds slump against the dollar in the last year or so. 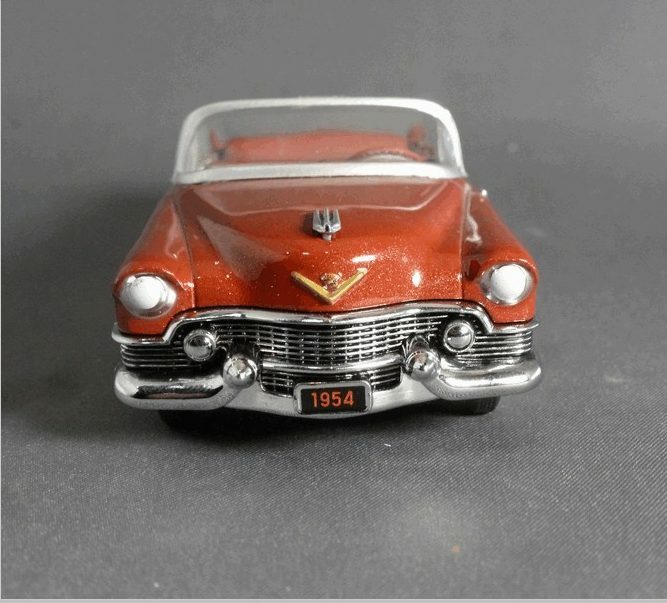 The quality of the models also seems to have risen to the point that collectors who dismissed the earlier ones as toys are now becoming interested. 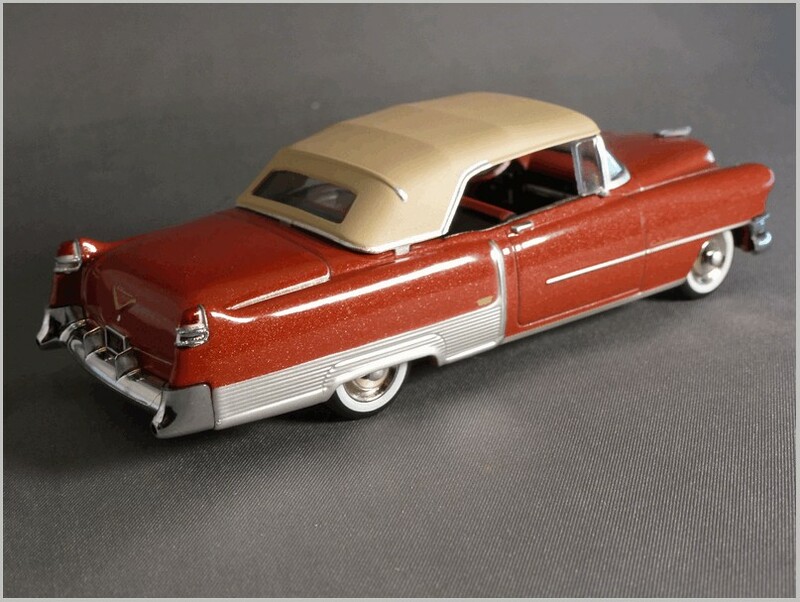 I have yet to obtain either of the Cadillac models, but the Lincoln was recently delivered. A large and impressive model marked as 1:43 on the baseplate. 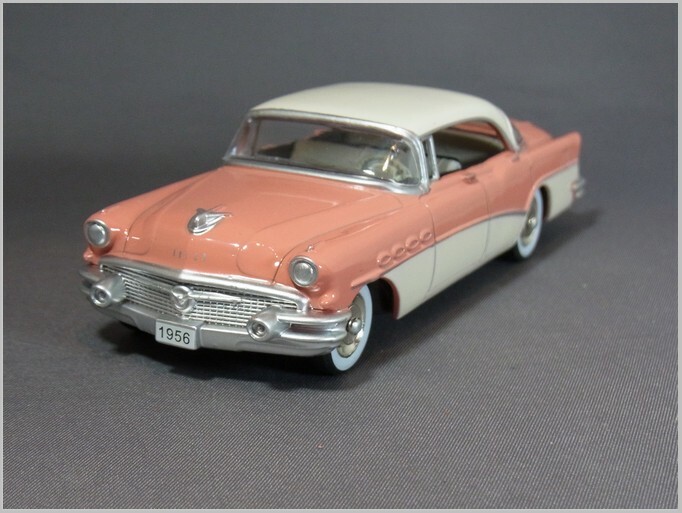 GFCC claim it is yellow but in fact it is in a ‘peach’ shade and looks very period US with two tone paint and lots of chrome. The chrome is largely printed on except for chrome effect components like bumpers, grille and mascot. The large grille is well replicated, though it could do with a black wash. The lights are simply part of the chrome grille assembly and could really do with being clear lenses or painted white. The massive mascot is neatly modelled and even picked out at the front in red. The Lincoln lettering is neatly printed. Lincoln and Premiere scripts are printed in gold on front and back wing respectively. Against this colour they are a little difficult to see but would be more striking on the light blue or violet painted versions also available. The rear is equally striking with the taillights painted in clear red over the chrome effect lights. And the boot chromed fitting is also red overprinted. 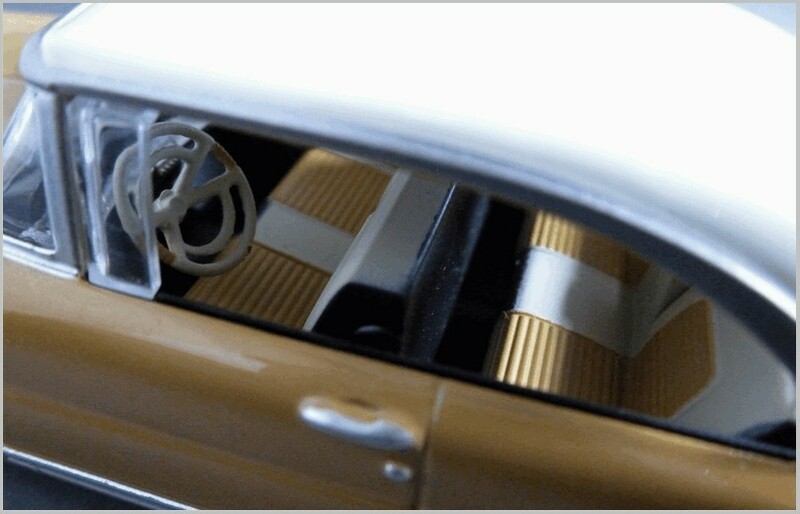 The two clear tubes visible through the rear window caused much debate on bulletin boards until, after a bit of research, they were identified as part of the rare air-conditioning option transferring cooled air from the unit in the boot to leave vents in the roof of the car. Inside is painted in considerable detail with the dashboard having a silver strip but no printed instrumentation which is a shame. The door cards are moulded in black but have no picked out detail. The wheels are toy like with silver dished hubs held in with an axle with domed ends. By coincidence these wheels actually look similar in some ways to the huge chrome dished covers fitted to the original car. The tyres are reasonable rubber ones with white walls which seem to compare well to many cars shown on the Internet. 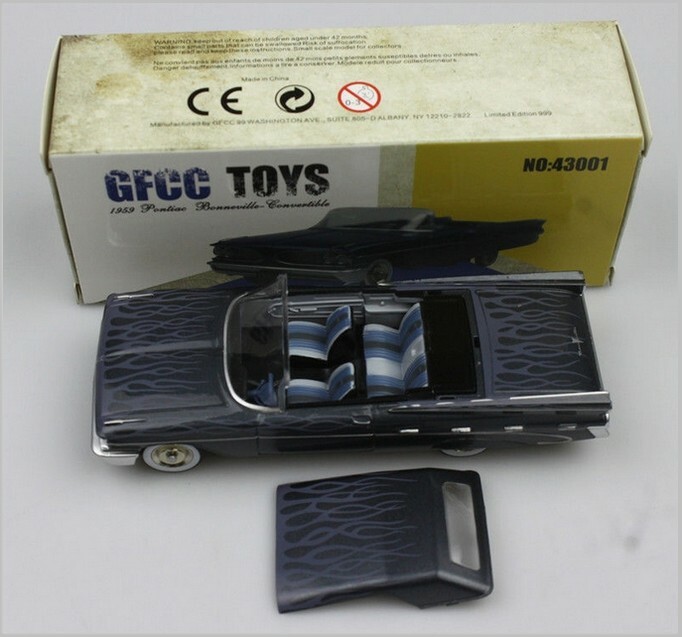 Other budget features are the printed door handles.So like all GFCC models to date a nicely made curiosity, not quite a detailed model and far too detailed for a toy. Unless otherwise stated all text and photographs are copyright of the Author. When Maz reviewed this little fellow in all its 1:43 glory (MAR Online, 31 Dec. ’17), he concluded that it “.. really would benefit from taking the model apart and treating it like a kit.” That’s when I decided it was time to find one for myself. 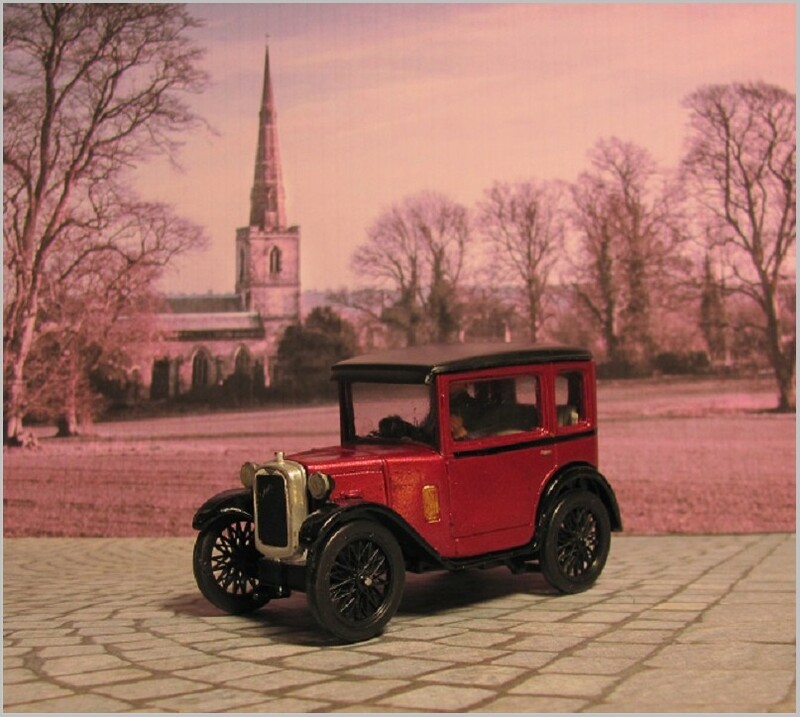 I acquired mine a couple of weeks ago (the postage from China was far more than I paid for the model); I had only pictures with which to compare, for I have never seen an Austin 7. 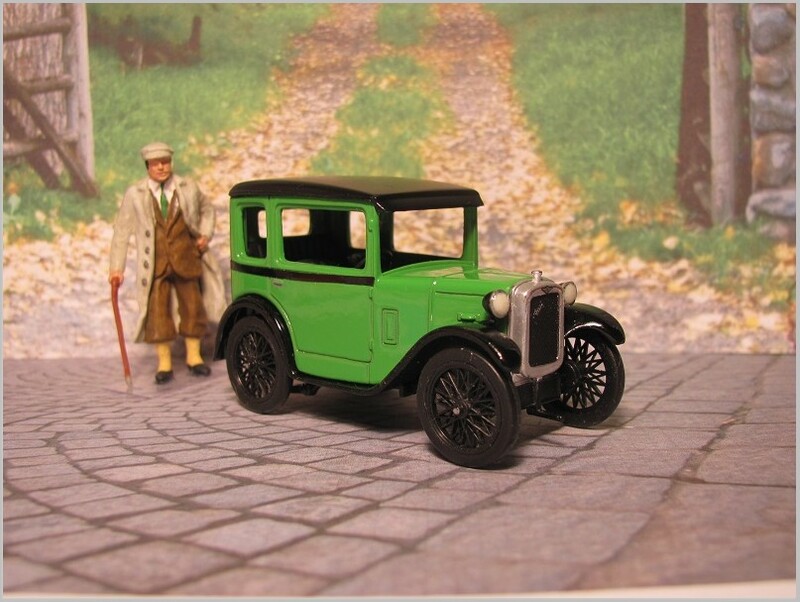 But surely the staid English motorists of 1930 would not have used this green! So I turned to my long-suffering internet pals on Forum 43 and braced myself. Comments flowed, “Needs window glazing,” “like the postal slot in brass,” and from Master John Roberts, “different colour?”. One collector even posted his hot rod version. Horrors! First, I made an attempt at just cleaning it up by touching the door handles and hub caps with silver/chrome, and adding a bit of pin striping. It still didn’t work. That green was just too green. So, I started with the conclusions of Maz and implemented the others as best as I could (where I agreed with them, anyhow). 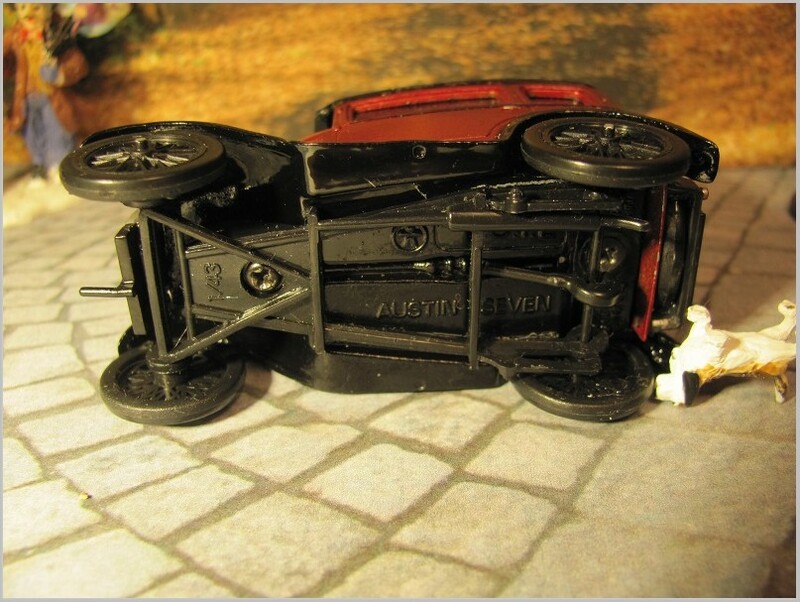 The model has two basic parts of die cast metal, being the cabin and the fenders/subframe. The rest, including a well-formed undercarriage, is plastic. The roof is also plastic, somewhat simplified. It appeared that the Austin was held together by two minute screws, but after removing them and the undercarriage, I found a third. Very small tabs, all plastic, tended to break as their glue gave way; but construction was so simple that they went back together rather easily. The window glazing was relatively easy, working from the inside, as the metal of the cabin is quite nicely finished. That is, until I attempted the windshield (that’s “windscreen” in the UK). Sorry if a smear shows, but even my third attempt was faulty. I applied a light grey on the seats to ease all that black, and even picked out a little of the minimal dashboard. One of the guys who hangs around my models volunteered to drive, and he is still there. This is how it arrived, well packed but with no pretty box. And so, we took it apart. And then I had fun! 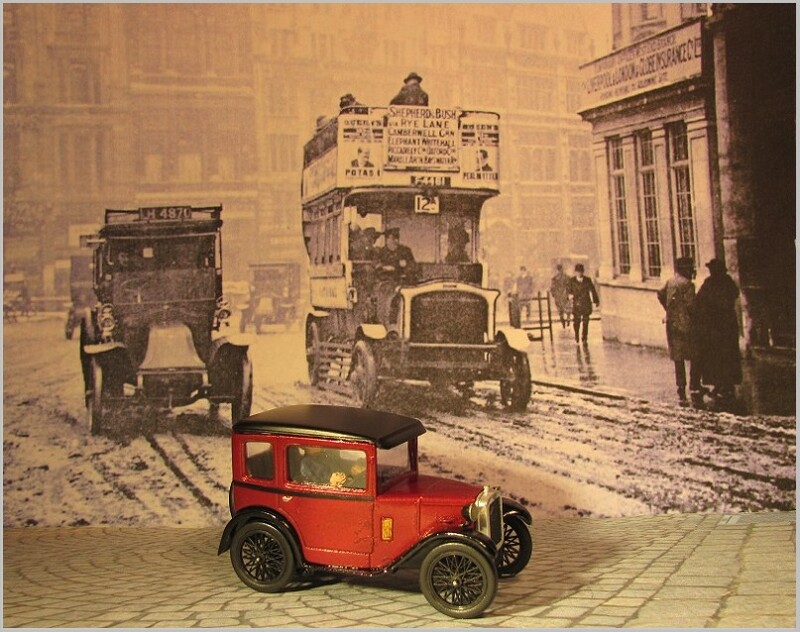 And here it is now, on the streets of London, c. 1930. Okay, this driver found some pavement. Here is how it looked in comparison to its English kin. That’s a Western Model’s version of the 1926 Rolls Royce Phantom 1 Doctor’s Coupe. And it’s a 2-passenger car. The Austin 7 was designed to handle four. Sometimes it’s fun to take something apart and put it back together. . . kind of. Yes these are both to 1:43 scale! Photographs are by, and copyright of, the Author. 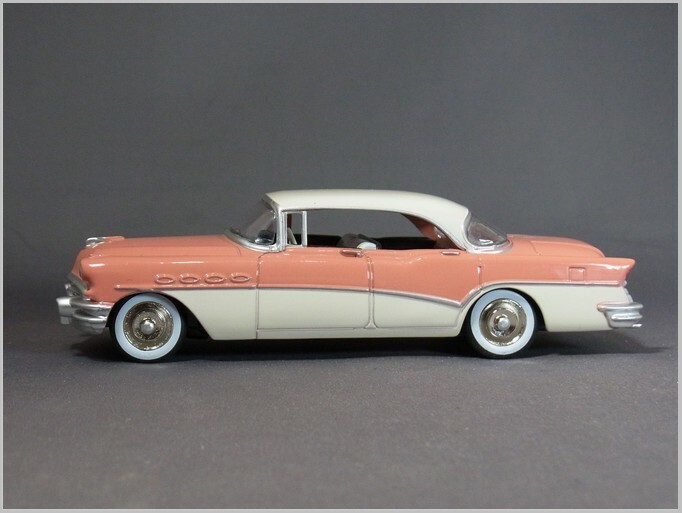 Here is the latest model from GFCC Toys a 1956 Buick Roadmaster Riviera Four Door Hardtop. Reviews of the previous Jaguar, Pontiac, and Studebaker models from this maker may all be found elsewhere on this site. 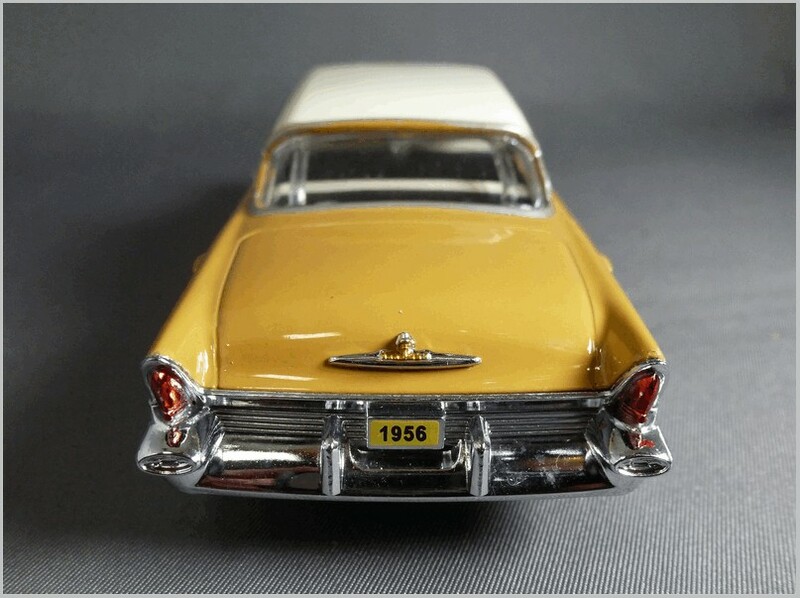 Although the models claim to be from a company registered in the US this seems to be a conceit as the models only seem to be available from Chinese sellers on eBay and on the Chinese equivalent of eBay, Ali Express. Perhaps due to the Chinese New Year holidays only the Jaguar seems to be listed at the moment. The Riviera four door hardtop was an extremely popular model outselling the conventional four door Roadmaster. It was certainly a large and impressive car and appealed to those who could not afford a Cadillac but who liked large and powerful cars. The side mouldings are printed neatly as are the door handles and quarter lights. The Buick “bullet holes” are there with four for the most upmarket version of the car but they have not been silvered as I would have expected. The version that I bought is in pink and white and despite having a plastic base plate it is quite a heavy model. 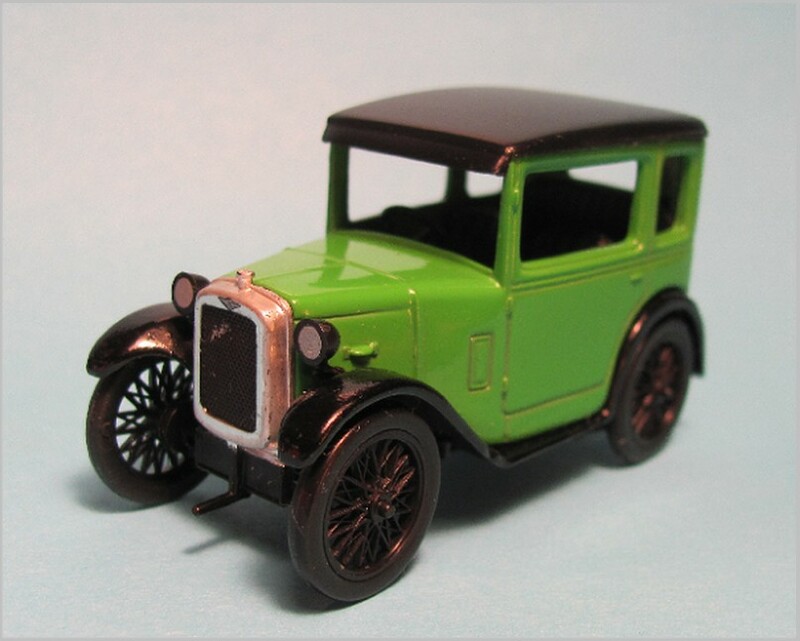 As on previous models the wheels are silver items with Dinky style round ended axles protruding. The grille is quite fine and the Buick badge is printed neatly and not oversized as I might have expected. The bonnet emblem is neatly cast and silvered. 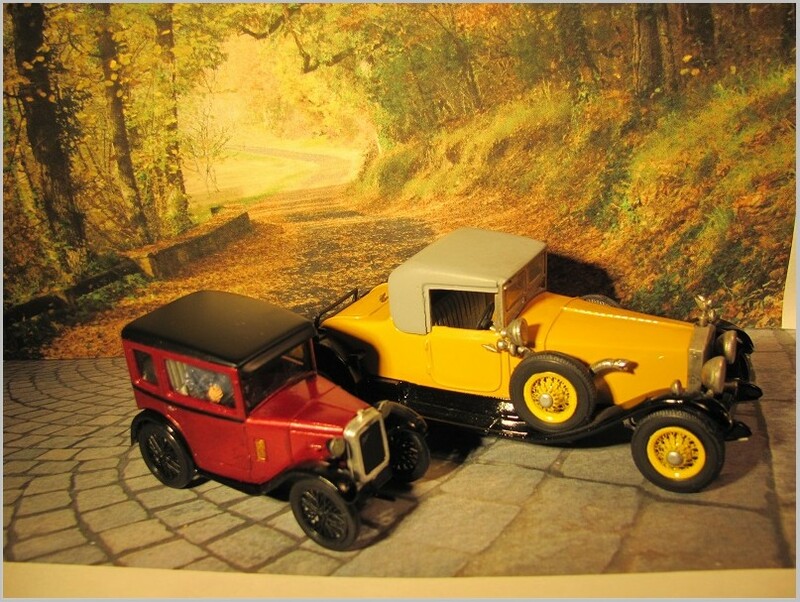 The silver used is more like that used on Atlas Dinky than the silver used on collectors 1:43 models. At the rear the lights have been done well but the lettering is very strange as it says CHRYSLER! Not exactly what you would expect. Under the corner of each bumper and exhaust end sticks out in silver plastic rather more detail than I would have expected. Inside we have a white dashboard and steering wheel as well as white seats. Though the backs of the front seats are in black. 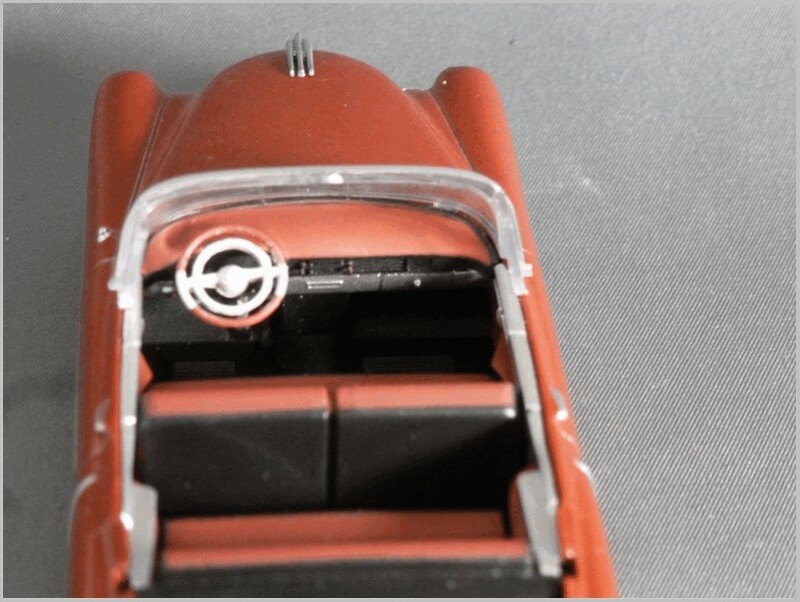 The dashboard has some quite detailed mouldings but nothing is picked out. Unusually the dashboard is in metal as is the steering wheel. The doors are fitted with plastic door cards rather than having them moulded into the casting . 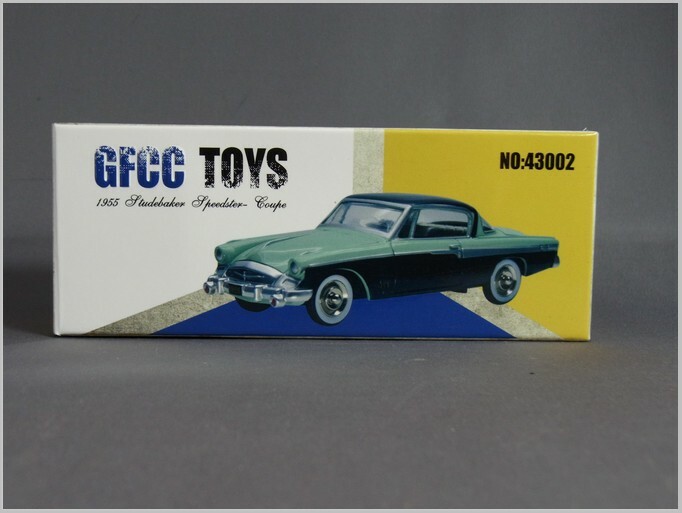 So yet again GFCC has produced a hybrid model which is neither a “proper” collectable or a Dinky Replica and once again it has a character of its own. All photographs by, and copyright of the Author. 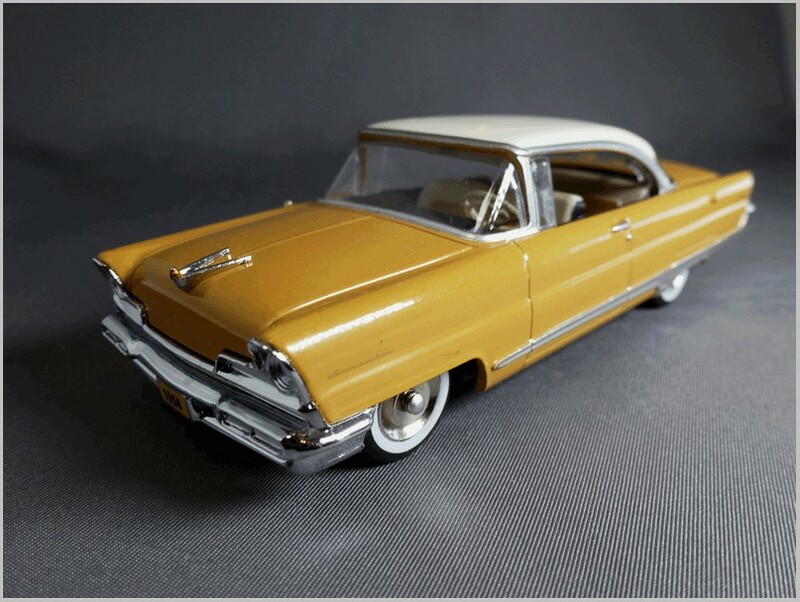 The GFCC Pontiac Bonneville has already been reviewed by Graeme Ogg in a previous article in MAR Online. 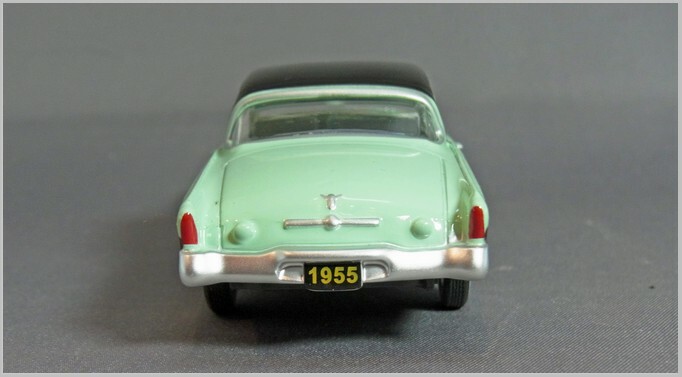 I have now received the next model available on eBay from this range; a 1955 Studebaker Speedster Coupé. This was rather dearer than the Pontiac, but including delivery to the UK it cost about the same price as a Corgi or Oxford 1:43 scale model. Again the model comes in a slightly curious box. But the box quality and the plastic inner and tissue packing is very like that used for Atlas models. There is continued speculation that these models may have been developed for a partwork or subscription series that was not launched. The Studebaker Speedster Coupé was sold in the 1955 model year only. It used a name previously used by Studebaker in the 1920s. It formed part of the President series and was based upon the President Hardtop Coupé. 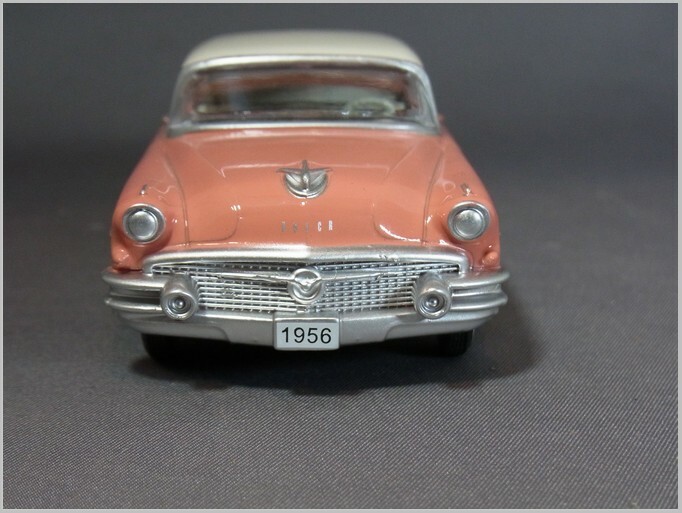 The 1955 model year cars were characterised by the introduction of massive grilles and bumpers. The Speedster was fitted with a large number of options as standard and was considerably dearer than the hardtop it was based on. 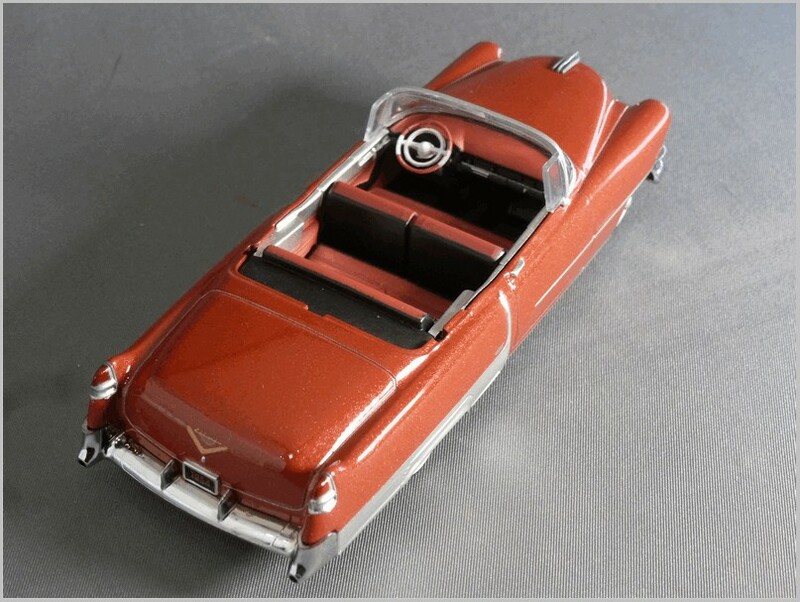 After showing the Speedster at car shows it went into production in the middle of the 1955 model year. 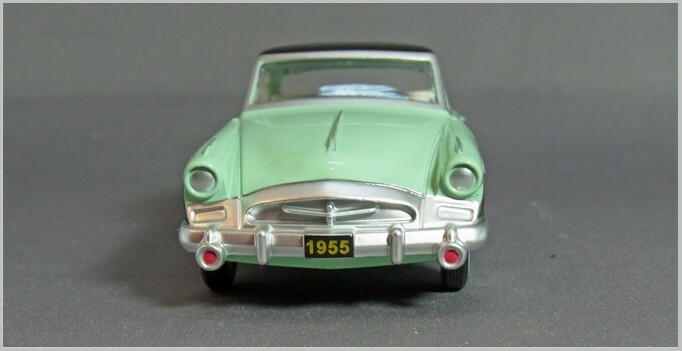 It was replaced in the 1956 model year by the Hawk series modelled by Dinky, Corgi and many others since. It is difficult to know what to judge the model against. 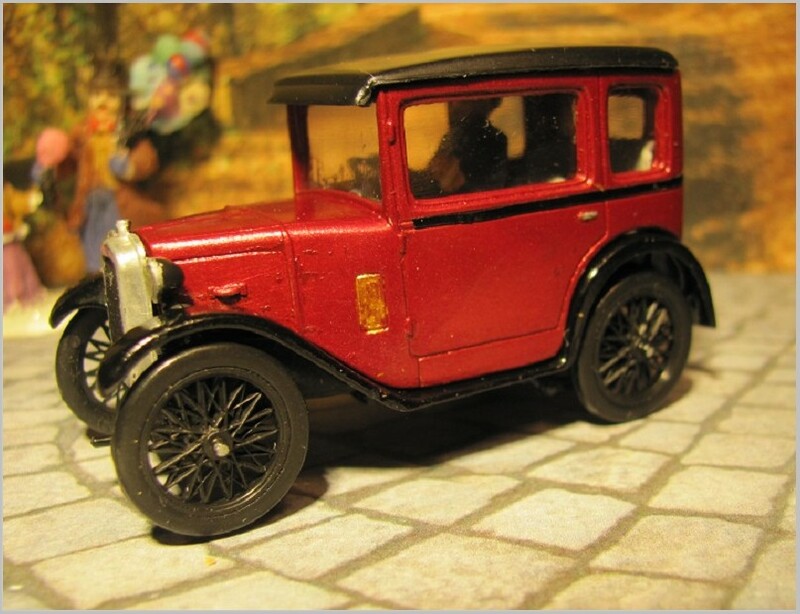 In many ways, although a diecast, it is like an early Brooklin but it has more Tampo printing. It has no separate inserted parts and lights are all painted on. In other respects, like the exposed axle ends, it is more like an old Dinky Toy but unlike a Dinky the interior has door cards, a detailed dashboard and steering wheel as well as the seats which represent the “Shoemaker-stitched” diamond-quilted genuine top-grain leather seating fitted to the original. So I suppose that it is closest in feel to a Dinky that has been given extra detailing. My model has a dashboard that has dropped to the floor. Normally I would quickly refit this myself but this model is fitted together with spun-over rivets so is not going to be easy to open. I hope other buyers find their dashboard properly fitted. The model has many of the features of the Speedster replicated in a simplified manner. The wheel hub shape attempts to capture the original but omits the false wire wheel sections making them toy like. At the rear the lights are painted in a simplified way and the reversing lights on the original are just bumps on the boot. The badging is also rather simplified. From the side the model looks nicely shaped though the heavy silver printed chrome is rather dull and the black roof and the printed window surround do not match properly leaving an incorrect strip of green between the chrome and the black paint. The massive front with its unblacked grille really reminds me of a French Dinky from the 1950s. The massive extra lights are incorrectly painted red pictures of the real car seem to show them in an orange colour. The rear too has a really Dinky like quality with the moulded in detail and no separate parts. It is a nice shape though capturing the car well. 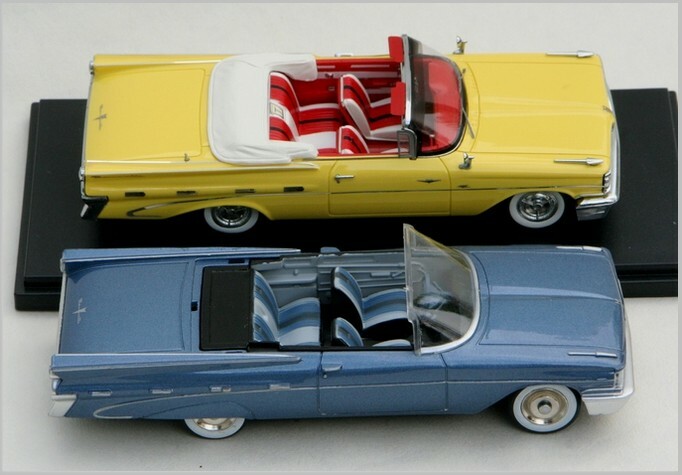 All these colour combinations can be seen in selections of photographs of the real cars. The only source for these models seems to be from the company ‘s direct sales on eBay. Photographs by, and copyright of, the Author. 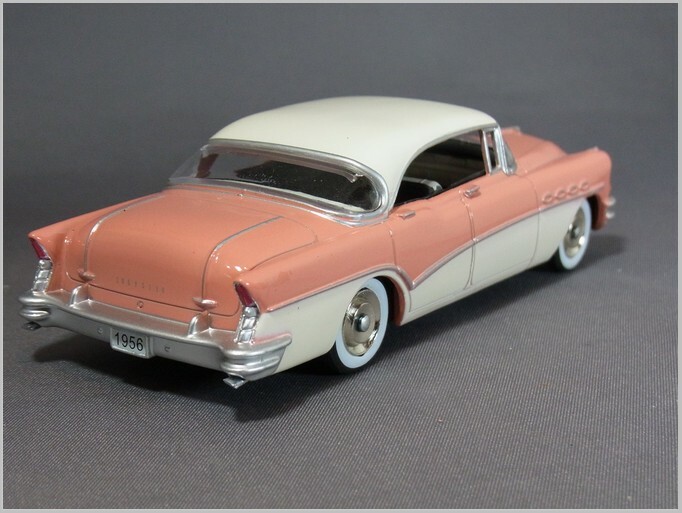 Earlier this month Graeme Ogg introduced us to the 1959 Pontiac model in this range. 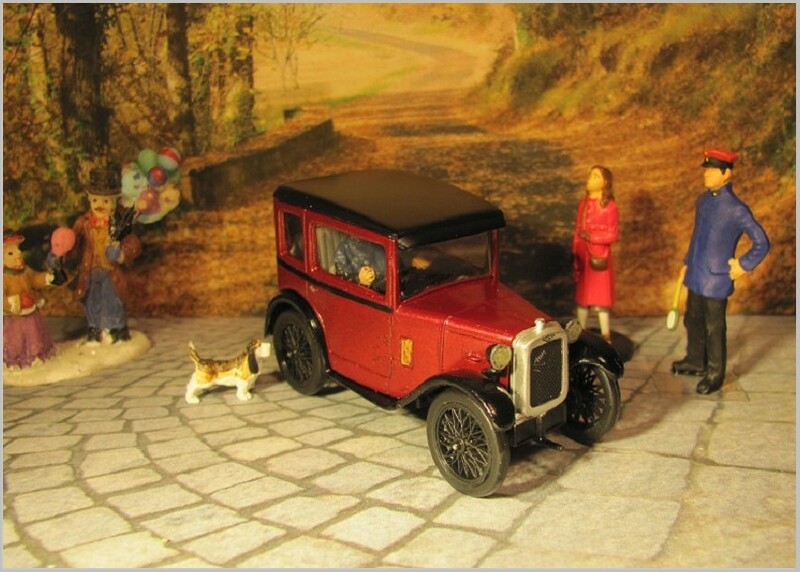 Now the Jaguar SS1 mentioned in that article has arrived from a China based eBay trader. 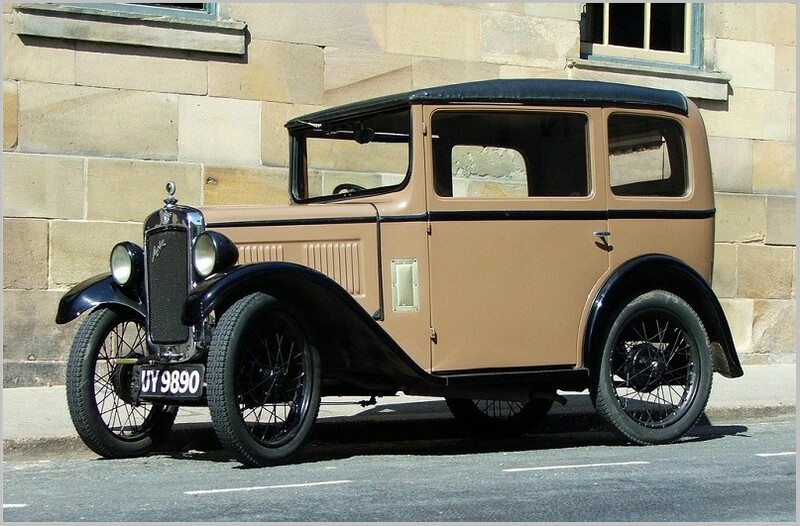 Although called a Jaguar SS1 It should just be an SS1 as the name Jaguar was adopted by William Lyons after the production of the SS1 had finished. This model is very different to the Pontiac Graeme covered. 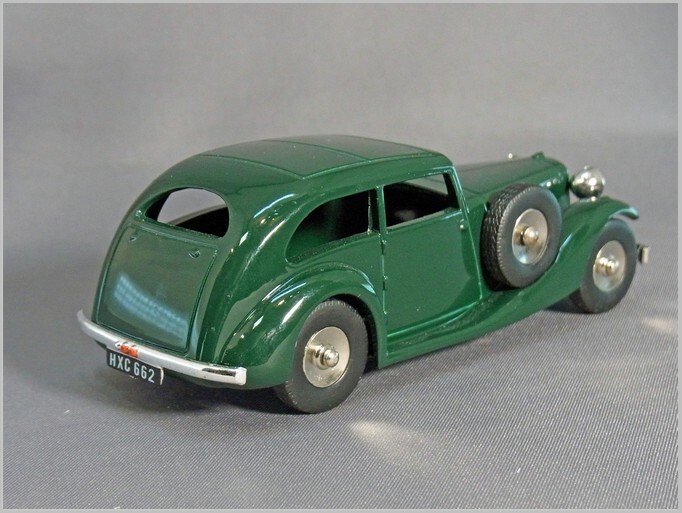 The SS1 being similar to earlier Dinky models with no glazing, suspension or interior. 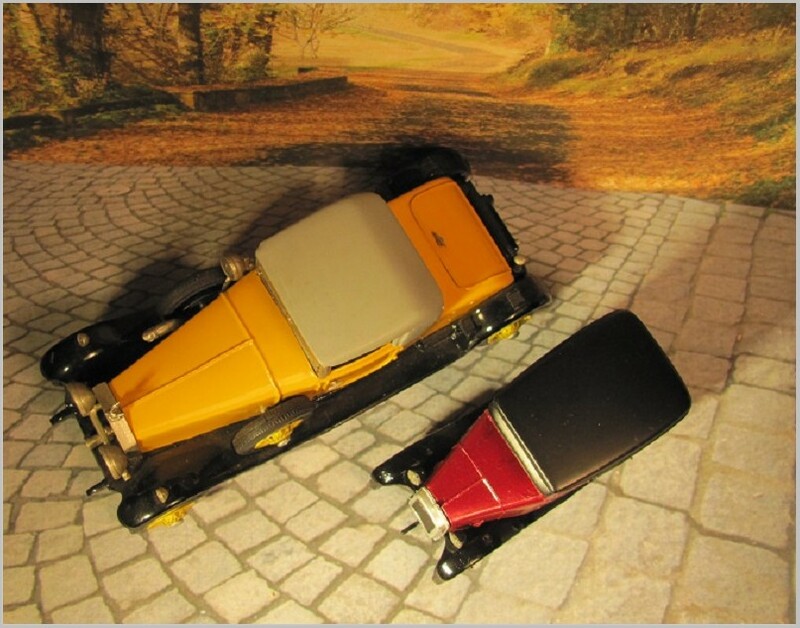 However, the bumpers and lights are solid shiny silver metal as are the wheels which is a little different to Dinky. The GFCC Jaguar SS1 model is available in dark red, cream, and dark green. 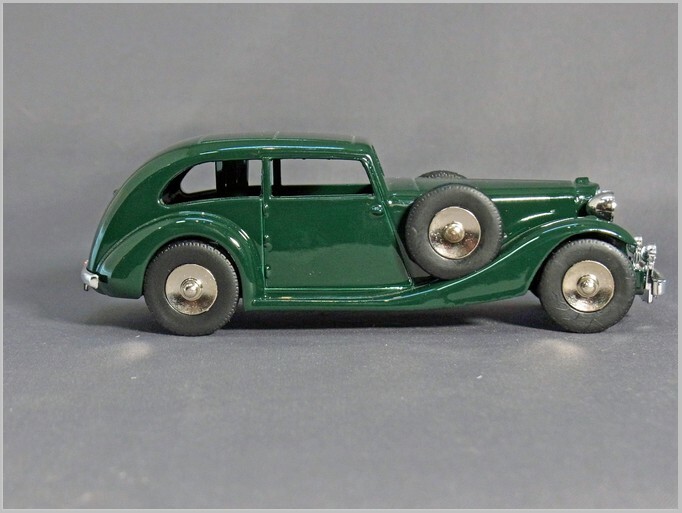 The model is well shaped with the lovely flowing rear end and a nicely detailed and painted grille, though that could have been painted to represent the silver radiator shell as well but has not been. It is based upon the Airline streamlined body available in the mid-1930s. It is curious that the box of the Pontiac was artificially aged but the box for this older style model is not. 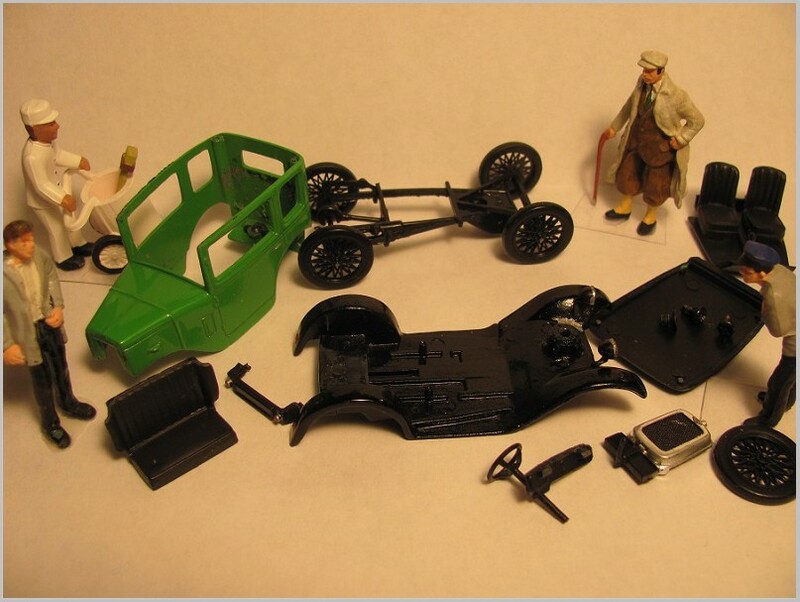 More surprising still is the fact that the spare wheels are not fixed to the car at all and only stay on the running boards when pressed hard into the depressions moulded for them. My model was sent from China but GFCC seems to be a registered brand of Tongbo Toys. This brand is registered in Europe as well as the US and may be a trading company brand rather than a pure producer. Maybe they pick up models developed in China for other ranges or speculatively and not proceeded with? I will certainly keep my eyes open for what comes next from GFCC Toys. We welcome your comments and questions. 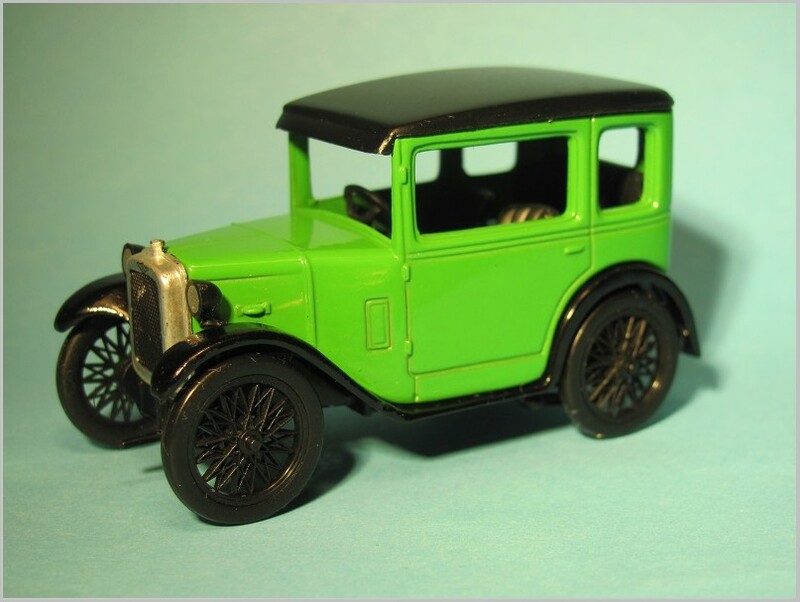 Please go to our Model Auto Review Facebook page or email the Editors at at maronlineeditor at gmail.com. 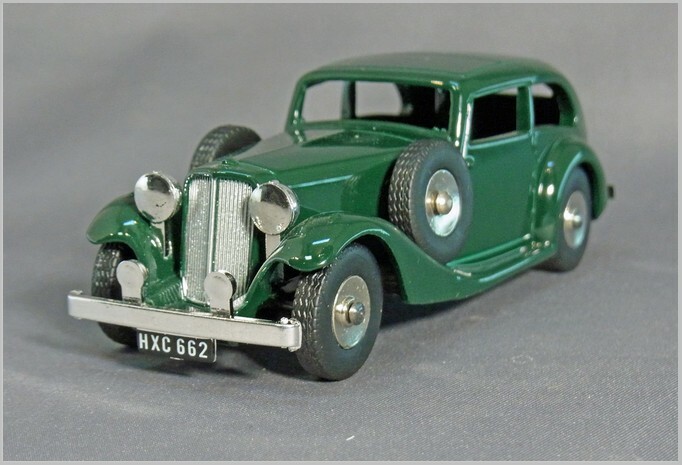 I read that Mr Editor Woolley is hoping to report sometime soon on a model of a Jaguar SS1 made by a new toymaker calling themselves GFCC Toys. [Editor: as the model is coming from China a review may be some weeks away]. Their official registered name seems to be Tongbo Toys Co Ltd, based in Albany, New York. and I’ve read that they are a toy and sports equipment marketing outfit rather than a model manufacturer, but apart from that I don’t know anything about them or what their intentions are in the 1:43 field. 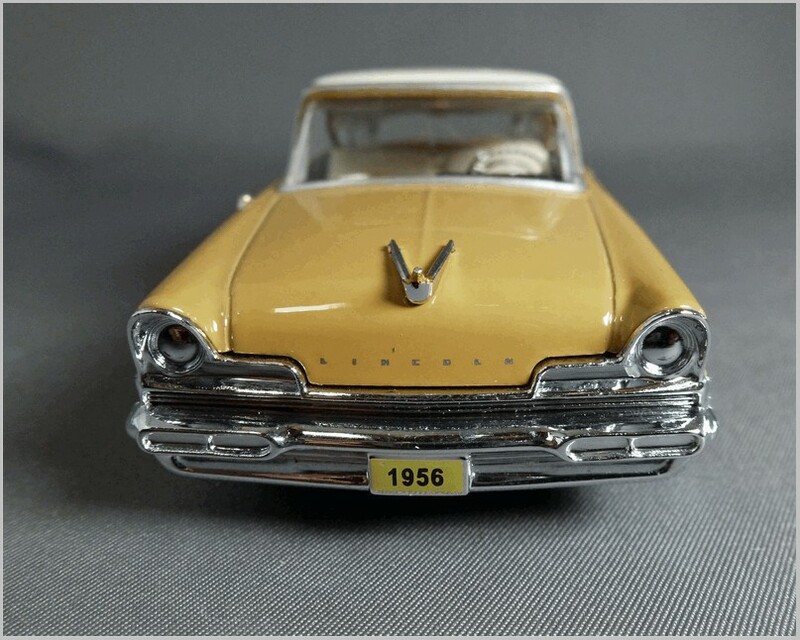 The models are produced in – surprise – China. 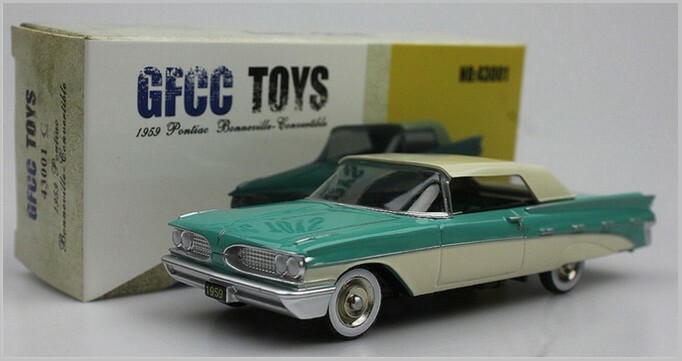 I’m not into vintage Jags, but GFCC have also issued a 1:43 model of a 1959 Pontiac Parisienne, which is more up my street. I don’t know why they’ve chosen to do this particular car in isolation, you’d have imagined they might have produced a small series of U.S. cars from this period, but there you are. You take what you can get. I’ve seen this model offered in the United States for about $15, but I think that may have been wholesale. The current retail price from a Hong Kong dealer is about £25 but that is with free postage, so it can be considered relatively “cheap and cheerful”. Mine has just arrived, and from some angles at least, it really looks pretty good, quite crisp and clean with a very smooth paint job. The windscreen frame (on my example at least) has no chrome or silver paint applied, it’s just clear plastic, and would benefit greatly from some Bare Metal Foil. The silver highlighting on the edges of the fins is a little weak in places and could also be improved with foil. The model lacks front vent windows, which could be made up easily enough from fine wire. But the overall impression isn’t bad at all. 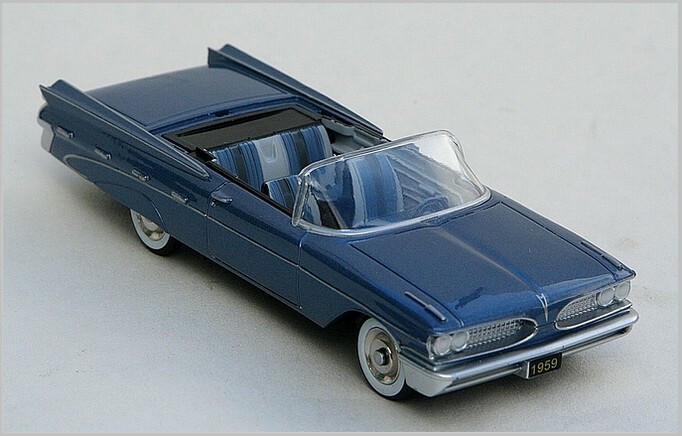 If the Neo versions of this car didn’t exist – and I don’t know if there are any other ’59 Pontiacs available in 1:43 apart from the rather expensive (and very hard-to-find Madison) versions from 2013 – it would certainly fill a gap in any collection of GM ’59s quite adequately. 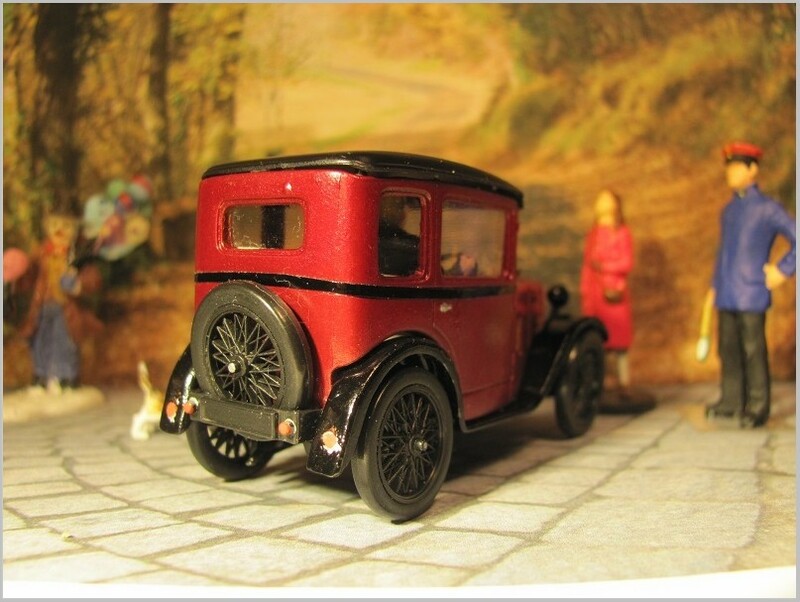 From the side, it sits a little high, and has very narrow tyres, so you are almost expecting to find a clockwork motor or friction drive underneath. 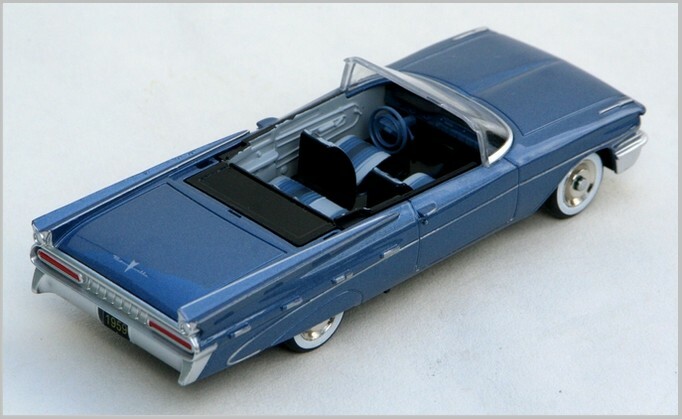 The clip-on top supplied with the model is very, VERY plastic-looking, so the car probably looks better open, even though it lacks a tonneau cover behind the rear seats. Obviously at this price you wouldn’t expect the model to match the Neo for overall quality or detailing (although at least it doesn’t have the awful black front screen surround of the Neo convertible), but it isn’t disgraced either. It matches the Neo for scale, length is identical and I could almost suspect they might have pirated the Neo body, although there are small differences here and there when you look closer. There is also a version in black with body flames, and a 2-tone version in not very authentic colours (it looks more like a contemporary Ford colour scheme to my eyes). The model comes in a “distressed” box, with fake dampstains and scratchy lettering, which is an odd sort of gimmick. We can probably expect to see some cretins on eBay offering these models as “rare vintage barn finds” at silly prices. It will be interesting (for me at least) to see if they do any more Yank Tanks, hopefully some that haven’t been done to death already. We welcome your comments and questions. 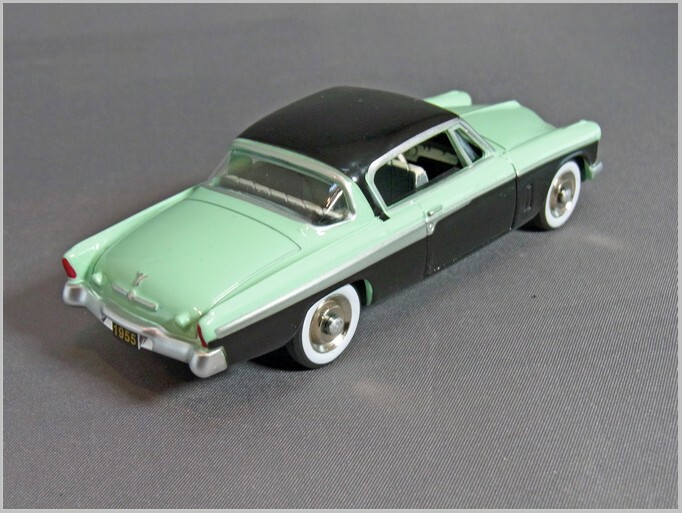 Please go to our Model Auto Review Facebook page, or email us at maronlineeditor @ gmail.com.